What can I do to make my T-jets faster? 1. I recommend first you deburr all the gears. This will get you increased speed with very little effort. Simply take some extra fine sand paper and place on top and under your gears while the car is running. Blow away excess brass "dust". You can actually bevel the ends of the gear teeth to minimize the amount of gear teeth contact and friction. 2. Secondly, increase brush tension. I do this by taking an x-acto knife or other pointed tool and push on the brush tensioner in the "V" back toward the rivet. This will start to bow the copper strip and automatically increase the tension. 3. Super II blue and yellow magnets (RRR#531)will also pick up the speed of your car. 4. Another tip I like is to use the AFX silver bevel brushes (RRR#503). The extra height increases brush tension and performance. I have also had very good luck using the JB's Thunderbrushes (RRR#399), they too work VERY WELL. The only downside with them is they are a little bit larger diameter than regular Tjet brushes, so a good clean or new chassis is recommended before installing the JB's. 5. Solder a small wire from each of the pickup shoes to their rivet plate. This ensures all power goes to the armature. 6. Balance the magnets. HUH? Yes, balance them by having equal pull by both magnets. I do this by taking a good sized nail and then place thin washers on the nail. See how many washers each magnet lifts. Write the number on the magnet and find the 2 equal numbered magnets that also have the highest numbers. 7. Polish the magnets. Deburr and polish the magnet's inside curved surface. This gives the most and equal magnet power to the armature. 8. Independent front wheels with trued round front tires. 9. Ride on the back of the pickup shoes. Bend and adjust the pickup shoe so the rail marks are to the back of the shoe. This minimizes front end bounce caused by the rails. 10. Find a high performance AFX armature such as the #779 Mean Green and install it. 11. Make the car roll. I like to adjust my cars so they roll a good long distance after I remove the power. This makes the car handle so much better thru the curves. This can be achieved by obviously minimizing axle/wheel friction but also by adjusting the brush tension. The brush tension is very critical as too much can make the car "brake" or lock up after power is removed causing the car to swerve in the back end. By adjusting the tension properly with some less tension, you can allow the car to "roll" thru the curves. 12. Use a 60 ohm controller. Many people use 45 and even 25 ohm controllers to race with. I like the varying speeds the 60 ohm controller gives me especially thru the curves. Think of it as a 10-speed bike versus a 3-speed bike. This will give much better handling characteristics to your T-jets. If you can't find a 60 ohm controller, call RRR and we'll set you up with a real nice Parma unit (RRR #217). If you want one of the best controllers for T-jets, I really like the new Professor Motor Controller. These are all PCB control and offer very smooth control on everything from T-jets, Tyco, Lifelike, and Tomys. They are great to use for racing. RRR also carries them, and are around $50 ea. and you'd have to call to place an order for one. 13. Of course, silicone tires will get you there fast. Believe it or not, a little light film of oil on the tires will really improve the traction of your cars. 14. Remove excess weight. Of course there are 10 million ways to do this, so I'll leave it up to you as to where you want to get rid of the weight. Some ways are: drill holes in gears; cut away chassis; use a lexan body; many many more. What can be done to make my gears stay on the armatures and rear drive shaft? The "make hole in gear smaller by punching the center...", doesn't work. It only flairs the top and bottom of the gear. The "glueing with super-glue"....Doesn't work. The oils and heat will break that down. The "soldering gear on".....Doesn't work. Too much work, and risk melting the gear plate getting the shafts hot enough to melt the solder. Brass and hardened steel don't solder well either. I've heard a lot of them, and tried them all, they are all temporary. But, I have a bullet proof way of putting on gears, even with the sloppiest fit, and the NEVER slip....even on dragsters. Drag slot racing and road slot car racing creates a lot of torque and stress on the gears with the arm shaft and pinion shaft. We are dealing with a simple tight friction fit. Do real 1:1 drag racers have simple V-belts on their blowers to drive them? No, they have teeth on their belts and pulleys. You can do the same thing with your Tjet, AFX and even tyco gears. We all know what the T-jet axles have to hold on the gears and wheels and those are called splines or knurling. Those lined ribs in the axles are splines and are actually larger diameter than the bare unknurled section that rides in the chassies axle holes. Its larger diameter because the material is displaced from the knurling operation. Well that's exactly what I do to my racing arms and pinions. teeth to OPPOSE each other, instead of offset nesting with each other. With these you will now be able to spline your arms and pinion gears. I take the shaft and with the pliers "bite" the shaft creating splines and displacing the material. I bite ONLY the thickness of the gear! If you bite too much the splines will be down in the hole of the gear plate, and you don't want that as it will cause resistance and make the car slow. So, only bite the thickness of the gear, do this once, you've now made two opposing splines. Rotate the shaft 1/4 turn and put two more splines in it, so you now have 4 splines. You want to put 4 splines in (2 bites with pliers) so the material is equally displaced when you put the gear back on self-centering itself. Since the gears are made of brass, it is softer than the hard steel, so when you press back on the gears onto the shaft, the splines will actually cut into the brass and push out small chips of brass. I've done this on the arm gears and top drive/pinion gear and never had one slip ever. You can even remove the gears several times and keep putting the same one back on without any slippage. The pinion gear because it is positioned in the center of the axle is a little more difficult to spline, but if you locate the area you want splined you can angle the cuts in the axle making it a limited area you spline. These are some quick easy ways to get your T-jets to go faster and hopefully they will help you to take the lead in your races. Please don't add traction magnets to your T-jets! This only destroys the skill and beauty of racing T-jets. Have Fun! 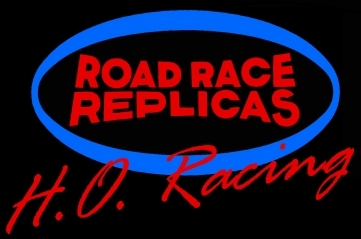 I hope this helps with your Aurora hop-up questions and if you need to find parts for restoring your cars, see Road Race Replicas for all your needs.